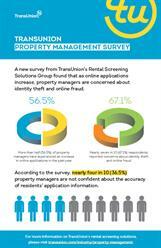 CHICAGO, IL--(Marketwired - June 16, 2016) - A new survey from TransUnion (NYSE: TRU) revealed how the growth of online rental applications has coincided with concerns of property managers about identity theft and online fraud. TransUnion's survey found that more than half (56.5%) of property managers have experienced an increase in online applications in the past year while nearly seven in 10 (67.1%) respondents reported concerns about identity theft and online fraud. TransUnion's nationwide survey was administered in May 2016 and included 163 property managers, the vast majority of whom manage more than 500 rental units. The survey findings are being released during the 2016 National Apartment Association Education Conference & Exposition in San Francisco. 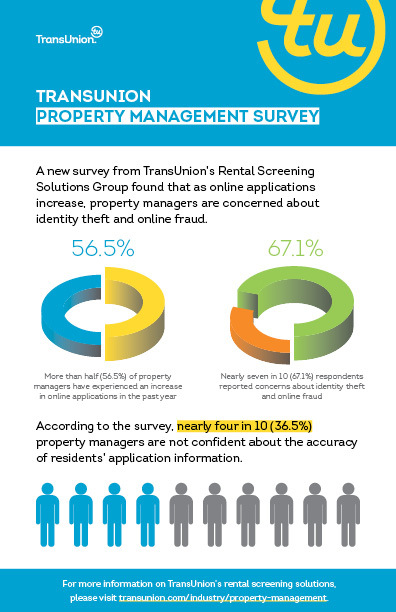 "In today's online and mobile era, residents expect quick approvals and smooth application processes, but property managers must remain cognizant of the potential fraud threat," said Mike Doherty, senior vice president of TransUnion's Rental Screening Solutions Group. "Online rental application fraud is a growing problem. In order to quickly approve good residents, property managers must arm themselves with solutions that provide greater certainty and verify identities online and detect potentially fraudulent applicants." TransUnion recently launched ResidentID to allow property managers to verify applicants' identities, evaluate the risk of a device used for an application and further evaluate any flagged applicant identities using text messages and targeted questions. In addition to providing greater certainty, the new solution seamlessly integrates with property managers' existing workflow and software and can be tailored to meet an individual property management companies' market and tolerance for risk. According to the survey, nearly four in 10 (36.5%) property managers are not confident about the accuracy of residents' application information. "This is a significant number because the survey also revealed that about one in four property managers said the cost of evictions has increased when identity theft or online fraud has occurred," added Doherty. "Credit history, prior rental payments and other screening techniques allow property managers to make smarter and better objective decisions on leasing to prospective residents," said Doherty. "As an emerging issue in the multi-family industry, property managers should pay additional attention to their online fraud and identity theft protocols to protect their business while allowing strong applicants through the rental application process faster."